Just like adults, children have good days and bad days. We expect a child to get angry, upset or irritable now and then. However, some children frequently experience intense emotions and may feel angry or irritable almost every day of the week. A child who often feels overwhelmed by emotion might regularly experience anger outbursts or behave impulsively. If your child has frequent outbursts, you might be wondering how to deal with a child with anger issues and if child anger management therapy even exists. How do you know when childhood behavior is something that needs to be addressed by a professional? If you do not know what to do or where to begin, you are not alone. Coping with challenging behaviors and emotions is not easy for the parent or the child, but there’s hope – no matter the cause of the behavior. For example, you might consider dialectical behavior therapy for children (DBT-C). DBT-C aims to help parents work with their child in learning helpful coping skills. DBT-C is a relatively new treatment program for children, but it is an effective option. Through DBT-C, children learn DBT coping skills so they can handle strong emotions and enjoy their time with friends, family and all the things that make them smile. You probably have a lot of questions about DBT-C and if it’s right for you and your child. In this piece, we hope to answer your questions about DBT-C and inspire healing. What Is DBT for Children? DBT-C is DBT that had been modified to address the treatment needs and developmental levels of children. DBT focuses on reducing emotional extremes, changing problematic thought patterns and teaching coping skills through a series of stages. This allows clients to regulate their emotions better, develop skills to live in the present and address the root problem. Part of DBT is also building a healthy lifestyle and working towards self-fulfillment. DBT is distinct from other therapies in that it strives to help the client find a balance between acceptance and change. DBT was originally developed to treat individuals with borderline personality disorder. However, it is used to effectively treat clients with other diagnoses such as mood disorders, eating disorders, anxiety and attention deficit hyperactivity disorder (ADHD). DBT has been shown to be an effective treatment for borderline personality disorder. DBT-C is based on the same DBT principles, but incorporates a caregiver element and focuses on the individual. Unlike our traditional DBT program, our DBT-C program does not involve group therapy. The main goals of DBT-C are to teach children adaptive coping skills and to teach their parents how to reinforce effective behaviors at home. DBT-C is a promising treatment for challenging childhood disorders. For example, one study found that children and parents were able to understand and use DBT-C child therapy tools, and children reported a substantial increase in adaptive coping skills and a decrease in depressive symptoms after treatment. The majority of children in the study said the skills were important and fun. All of the parents in the study thought their children benefited from the program and found the skills child-friendly. What Are the Best Ages for a DBT-C Program? DBT-C has been modified to suit the developmental levels of children ages 6 to 12. Older children and young adults might consider regular DBT treatment to address challenges with emotion regulation and harmful behavior patterns. When Should Parents Consider DBT-C for Their Child? You might be wondering if your child would benefit from DBT-C treatment, or if he/she will naturally outgrow outbursts. Although not every tantrum is a sign of a deeper issue, children who are irritable or angry most days of the week may benefit from receiving treatment as soon as possible. DBT-C might help prevent mental health conditions, like anxiety and depression, down the road. High emotional sensitivity: A child who reacts immediately and intensely to an emotional trigger may have high emotional sensitivity. A child with high emotional sensitivity may experience long-lasting reactions, and find it challenging to process emotions due to extreme arousal. Corresponding impulsive behavior: In response to emotional sensitivity, a child might display frequent anger outbursts involving either verbal or physical aggression, or self-injurious behaviors. Disruptive mood dysregulation disorder(DMDD): DMDD is a diagnosis given to children who experience frequent outbursts and tantrums, or who are angry and irritable almost every day. With DMDD, severe outbursts usually occur several times a week. DMDD is a relatively new diagnosis, and a clinical trial found that DBT-C may be an effective treatment for this disorder. ADHD: Many children have a lot of energy and may be inattentive, but sometimes hyperactivity and impulsive behaviors are a sign of ADHD, especially if symptoms negatively affect school, home life and relationships. A child may be diagnosed with ADHD if he/she has trouble focusing and following instructions, are easily distracted and have trouble staying seated in school. DBT-C might help children learn ways to cope with ADHD symptoms. Other diagnoses, such as depression or an anxiety disorder, can also lead to symptoms of high emotional sensitivity. It’s worth noting that children with high emotional sensitivity often also experience enhanced positive emotions, increased creativity and greater empathy. Also, if your child displays any of the above behaviors, whether from a mood disorder or other diagnosis, that does not mean something is wrong with him/her. DBT-C can help your child learn techniques to cope with high emotional sensitivity in a way that is beneficial to his/her wellbeing and relationships. What Skills Does DBT-C Focus On? In general, DBT-C focuses on skills that help children and parents be more aware of their emotions and the impact of their behavior. Children in a DBT-C program will also learn skills to tolerate stressful situations and effectively express their thoughts and feelings. DBT-C presents coping skills and strategies in a way a child can understand and use. DBT-C therapy might focus on the following areas. The core skill of DBT-C is mindfulness. Through individual therapy sessions, children will learn and practice mindfulness skills to be aware of their thoughts and feelings in the present moment. One of the principles used in DBT and DBT-C is the idea of three states of mind – the emotional mind, the reasonable mind and the wise mind. The wise mind represents a balance between emotions and facts. Children will learn skills to activate the wise mind, such as “what” and “how” skills. What skills involve observing and describing what the child is experiencing. How skills teach a child how to react to the reality of a situation and reach goals by looking at the facts. Distress tolerance skills help children get through difficult situations without making the situation worse for themselves. Distress tolerance involves accepting reality rather than refusing to tolerate stress. Children will learn ways to control emotions and behavior to make it through a tough situation. For example, a therapist might encourage a child to try distractions such as watching a movie to get through a moment of distress. A therapist might also recommend engaging in self-soothing techniques to overcome a crisis, such as listening to calm music or taking a warm bath. During DBT-C treatment, parents will learn unique ways to help their child cope with a challenging situation that work specifically for their child. Emotion regulation skills can help a child reduce the pain of intense emotions. DBT-C teaches children to be mindful of their emotions, and view their emotions as a wave. The goal of DBT-C is not to get rid of emotions, but to help a child “surf” the emotional wave to decrease suffering and emotional vulnerability. 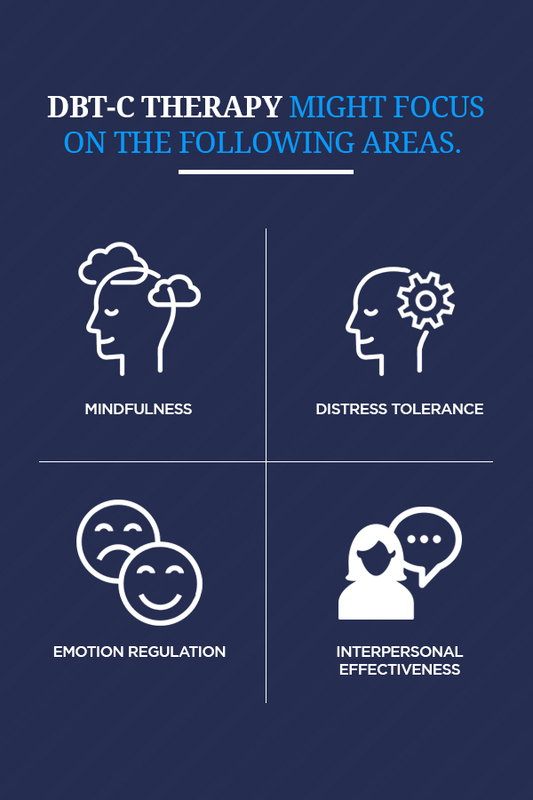 DBT-C also emphasizes the importance of taking care of physical health, learning to let go of worries, setting goals and increasing positive emotions. Through DBT-C, children learn they are not their feelings, and they do not have to do what their emotions tell them to do. DBT-C teaches children interpersonal skills to help a child get what he or she wants while maintaining relationships with peers, family members and others. Children learn ways to express their thoughts and feelings directly, and they learn how to ask for what they want while being assertive, respectful and fair. What Are the Components of DBT-C? There are two main components of DBT-C – individual therapy and parents skills training. Individual therapy sessions focus on teaching the child about his/her emotions and why they matter. During DBT-C sessions, a child will work with a therapist to develop and build DBT coping skills. Together, the child and therapist will discuss goals and address issues as they arise. Therapists will target destructive behaviors. Children do not possess the ability to fully take advantage of DBT skills alone, and they require the support of their parents to reap the most long-term benefits from DBT-C treatment. The parent component of DBT-C trains parents to take on the role of their child’s counselor once treatment ends. This continuous support is critical to helping a child stay on track with DBT coping skills. Parents do not have to worry – they will learn everything they need to know throughout their child’s treatment. For example, parents will learn how to model skills, how to create a validating environment and how to help their child practice DBT skills every day. The parent component of DBT-C also aims to improve the relationship between the child and parent. How Are Parents Part of DBT-C? As mentioned above, parents play an essential role in their child’s treatment. In a study, parents report learning DBT skills helps their ability to help their child use skills, and it also helps them regulate their own emotions. Caregivers also say that it helps to validate a child’s feelings before practicing skills. Principles of dialectics: Parents and the therapist will discuss how there is no absolute truth and opposites can both be true. Creating a validating environment: Parents will learn the importance of actively listening to the child and accepting their thoughts and feelings as meaningful or justifiable. They will also learn how to observe and reflect feelings back without judgment. Behavior change techniques: Parents will learn ways to influence their child’s behavior and how to reinforce behaviors effectively. Reinforcement: Parents will learn how to reinforce DBT skills and adaptive behaviors. They will also learn how to practice reinforced skills with the child daily. Punishment: Parents will learn the difference between effective and ineffective punishment, and the best ways of handling their child. My Child Is Acting Out – What Can I Do? Sometimes a child acts out due to a mental health condition such as ADHD. ADHD and other common childhood mental health disorders are highly treatable. Raising a child is far from easy. Sometimes it can be hard to tell if a child needs help or if the child is just going through a phase. As a parent, you do not have to face the challenges of raising a child alone – we are here to help. At Hillside, we are excited to bring DBT-C treatment to the Atlanta region. DBT-C is a new treatment modality specifically developed for children. As a leader in the realm of DBT, we have DBT-C educated clinicians ready to help you and your child learn effective coping skills and methods for practicing them at home. To learn more about our DBT-C treatment facility, contact us today or visit our admissions page to arrange treatment.